In terms of pantry space, our house did not come equipped with much. As she is approaching her 100th birthday (yes, I have decided it is a lady house), this probably doesn't come as a surprise. The closet that we were using as a sort of pantry (really just a place to store plastic bags, brooms, and miscellaneous crap) is in the mudroom area of the house, probably added on in the 1990s. Boyfriend and I decided that we wanted this closet to be a pantry some time ago. We bought a plastic shelf at Lowe's to put in there until we could decide what we wanted to do. It stayed in it's shrink wrap until Monday when we were finally able to make time to see what was what in the pantry. Boyfriend constructed the plastic shelf and determined very quickly that it did not make sense to use that particular shelf there. Dang it. He said it would be good for the basement, though, so I agreed and we went to Lowe's to find something else. We came home with a metal shelving unit that was about two inches taller than it should have been. Since we didn't want to sacrifice the wooden shelf in the closet, Boyfriend used this fancy drill bit I've never seen before to make some holes into which the legs of the metal shelf could go. It was impressive, let me tell you. The shelf, after he made the adjustments to the existing wooden shelf, fit beautifully in the closet. Now I have what we refer to as "our very own grocery store" right off the kitchen!! I am super excited and now I can use some of my cupboard space for more dishes and various kitchen items. How nerdy is it that I am so psyched about this? It's just one of many things knocked off my home improvement to-do list, but it feels like quite an accomplishment. 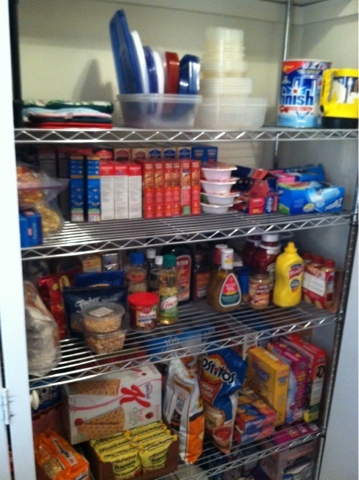 Pictured: one awkward iPhone shot of the filled pantry. The space in the mudroom is so tiny, it was hard to get! Also, I'm pretty sure the picture is ultra-blurry. I'm sorry.